A taxicab in Tokyo shows just how much Japan wants Malaysian tourists, and vice versa. AISHA Luthfi stares into the food display case at a Starbucks counter, scrunching her face as she tries to pick out lunch. All the labels are in Japanese, and though she speaks the language well enough, she can’t quite read it yet. But after four months of living as a student in Tokyo, there are certain realities she has come to terms with – food being the biggest one. She points to one of the sandwiches and speaks to the staff in Japanese. “Pork!” he says, pointing to a ham and egg baguette. Then he picks up the plate right next to it with what looks like a turkey and cheese croissant. “No pork!” he assures her. Minutes later, she’s munching down and talking about what it’s been like for a Muslim girl living in Japan on her own. To be fair, she says, she comes from what many would consider a liberal family in Indonesia. So when it comes to religious requirements like halal food, she’s inclined to make the best out of a tricky situation rather than segregate herself from social groups. Aisha’s approach to food is something that the Japan National Tourism Organisation (JNTO) and the Malaysian Association of Tour and Travel Agents (Matta) are hoping could segue into a bigger picture as they work together to shape and promote a halal tourism campaign for Malaysians visiting Japan. On a recent four-day “technical visit” to Tokyo, Yokohama and Sendai, 25 travel agents, along with JNTO staff, several Matta delegates and media representatives, were shown how halal-friendly Japan could be – or at least how much effort they put into it. Amidst halal tourism presentations and tourist attraction pitches – Tokyo Skytree, Disneyland, winter strawberries in Sagae City (it’s a huge deal in Japan) – there were lunches at Indian restaurants (Khazana in Minatomirai, Yokohama), dinners at Malaysian restaurants (Rasa Malaysia Cuisine in Ginza, Tokyo), and specially prepared seafood meals at various places. All of this was to show the agents and the media that Japan is a safe place for Muslims to eat and that the local hosts are happy to respect and accommodate their needs. But the random reactions of some agents in the group point to a deeper challenge that could come from more conservative Muslim tourists in Japan. Unable to get a straight answer, he skipped the side dish but tucked into the rest of the vegetable tempura and sashimi mains on the table. Meanwhile, another agent opened up a cup of instant porridge brought from KL. “The thing is, we need to speak to travel agents in Japan and get them to understand what halal travellers want, and at the same time, we need to inform halal travellers of what they can and cannot get,” adds Ace Altair Travel executive director Vimala Devi, who understands travellers with special needs better than most. Her agency coordinates travel groups for the disabled. This halal need includes visits to mosques, of which there are few and far between in Japan. According to one list of “masjid in Japan” on the Internet, there are 12 mosques in Tokyo, including the oldest mosque in Japan, the Tokyo Camii in Shibuya-ku, which doubles up as the Turkish Culture Centre in the basement. But unlike in Malaysia, mosques in Japan are more likely to be privately-run, members-only prayer halls. “Wow, so you can’t just walk in and pray?” said one surprised agent, admiring the gorgeous architecture of the mosque. According to one Japanese news report, the Muslim population numbers just under 100,000, and most of them aren’t Japanese. In fact, it’s thought that there are fewer than 1,000 Japanese Muslims in a country of 120 million people. So it’s a major challenge to ensure halal food and places for worship even for the locals. Inevitably, by the end of the trip, the travel agents cared a little less about how exactly halal a place was, considering there was bacon right next to the waffles on the breakfast buffet line at the hotels. But there were also clearly labelled dishes marked halal, which were obviously catered for the Malaysian group, which goes to show just how good the Japanese are at hospitality – and how much they want our business. As for beverages, he told the conference “since the consumption of alcohol in Japan is high … it is advisable that Muslim travellers understand this norm despite restaurants serving halal meals.” And as for mosques, he pointed out four facts: there are “limited number of mosques, some are restricted to members only, prior consent is required”, and it’s better to delay evening prayer times until you can get back to the hotel. All this is vital information for halal travellers, travel agents pushing halal tourism and their Japanese counterparts, if the whole campaign is to really take off – and Japan has a lot riding on it. JNTO’s research shows that the number of Malaysian visitors to Japan has grown steadily over the last three years while tourism numbers from Singapore and Hong Kong have gradually declined. According to JNTO manager Susan Ong, for the year ending in 2012, visitor arrivals from Malaysia to Japan set a record high of over 130,000, up almost 14% from the same period in 2010, fuelled by a growing middle class that can afford to travel and the launch of low-cost carrier routes to Japan. With so much at stake, it’s hardly surprising that JNTO and Matta have signed a memorandum of understanding on how they can make halal tourism a viable industry for both Malaysia and Japan. “This collaboration is very timely as 2013 marks the 40th year of Asean-Japan friendship and cooperation. With the signing of MOU between JNTO and Matta, we hope to increase the number of visitors from Malaysia as Japan expects to receive one million tourists from Asean countries in 2013,” said JNTO executive director Motonari Adachi in a statement. On their part, Japan really seems to be going for it. According to a report in The Mainichi, a halal food trade fair showcasing about 40 items of processed food, condiments and confectionary made in Japan according to Islamic guidelines was held in Fukuoka city in February, organised by the Nippon Asia Halal Association, and drawing about 20 exhibitors and 600 visitors. One company, Inoue Spice, offered curry roux using mushroom and seaweed essence in place of beef or pork stock. Another company that’s making a name for itself in halal tourism is the Miyako Kokusai travel agency based in Osaka. Company director Kazunari Kurosawa said he’d learned about halal food and worked with Japan Halal Business Association (which is approved by Malaysia’s Jakim Department of Islamic Advancement) officials to develop non-alcoholic, pork-free environments for halal visitors. Meanwhile, JNTO has created an official halal guidebook for tourists, listing restaurants and places of worship in Japan. What’s obvious, however, is how little actual Japanese food is on the menu – the book is loaded with listings for Arabian, Iranian, Egyptian, Moroccan, Turkish, Pakistani, Bangladeshi and Indian restaurants. 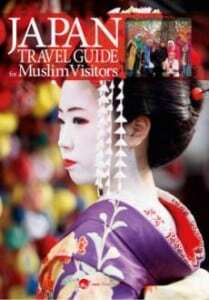 The book, titled Japan Travel Guide for Muslim Visitors, is being distributed to travel agents and their clients (downloadable from www.crescentrating.com).